Cannabis may have a negative public image, but the situation is rapidly changing. In the United States, two states have finally made the plant legal for recreational consumers who are looking for a safe alternative to alcohol. While marijuana is still illegal in numerous parts of the world, the team at Royal Queen seeds understands that Cannabis connoisseurs are often viewed as criminals for no legitimate reason. Many people believe in their government, but they have been routinely mislead by disinformation campaigns. To help you gain a greater understanding about the differences between a benign plant and other recreational substances, we've compiled this list that shows why Cannabis is much safer than alcohol. While many people prefer to smoke marijuana, consumers can also enjoy freshly baked goods that are made with the plant. It doesn't matter if you consume Cannabis Sativa, Indica or one of our auto-flowering marijuana strains, you can enjoy a medicinal plant that includes essential amino acids and Cannabinoid acids that include hundred of compounds that can prevent cancer and improve nutrition. Alcohol has been shown to help lower blood pressure, but that's the only medicinal usage the substance has. Medical marijuana has shown itself useful for a wide variety of conditions, such as pain relief. Alcohol can prevent muscle growth because it decreases the body's testosterone levels, and the substance can also impact sleep. On the other hand, those who enjoy smoking marijuana are not subject to any issues that could affect muscle growth. Alcohol consumption increases the risks that users will suffer a serious injury. In one study, 36 percent of assaults that led to hospital stays were related to alcohol consumption. On the other hand, a study from the UK found that cannabis does not lead to risk-taking behaviors. Currently the United States government declares that marijuana is in the same category as heroin and that the substance has a high chance for addiction. This premise is quite laughable to anyone who has ever enjoyed marijuana. Alcohol on the other hand is highly addictive, and the withdrawal symptoms of those who quit drinking can be fatal. Cannabis fans are not subject to any physical withdrawal symptoms. Alcohol consumption has been linked to a range of cancers, like stomach, esophageal, lung, pancreas, and liver. Marijuana is commonly prescribed to people who are suffering from the debilitating effects of radiation and chemotherapy that are used to fight cancer. In one recent study, researchers found that marijuana users actually had a lower chance of developing neck and head cancers. Additionally, it seems plausible that smoking marijuana could lead to cancer, but because Cannabis is a powerful expectorant, it may actually reduce the risks of developing lung cancer. In research that was published in 2006 and conducted at the University of California Los Angeles, researchers actually found that marijuana smokers had lower incidences of lung cancers compared to those who do not enjoy Cannabis. 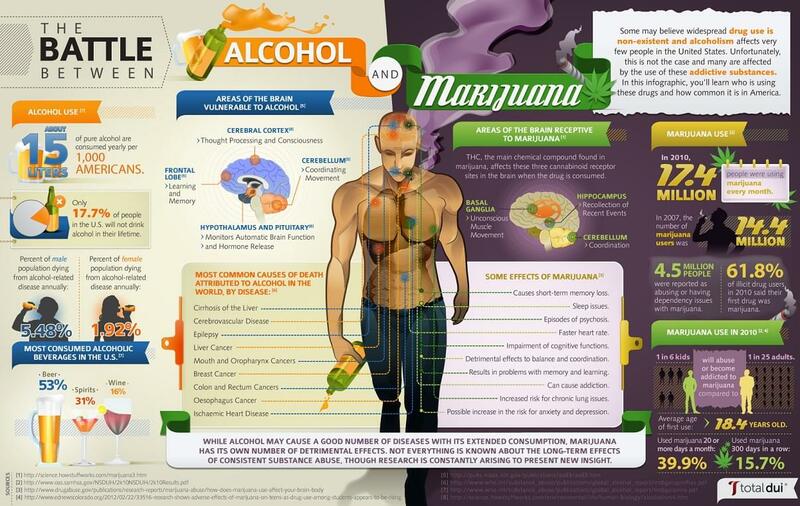 Regular alcohol usage damages the brain, but marijuana does not. In fact, numerous studies are currently coming to light that indicate Cannabis has a number of neuro-protective properties that can actually improve brain function. Alcohol consumers present a much-greater strain on the healthcare system and cost society much more money. According to a study in the British Columbia Mental Health and Addictions Journal, alcohol consumption costs society $165 per user in comparison with a mere $20 for those who enjoy smoking Cannabis. You can smoke all the Cannabis that you want, and you'll never need to worry about an overdose. 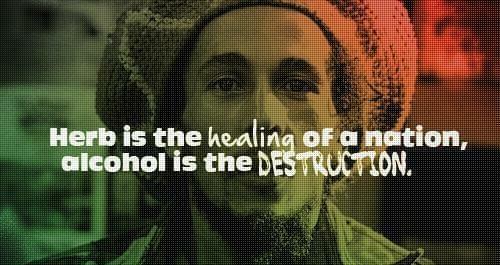 Alcohol is one of the most dangerous drugs on the planet, and people die every year as a result of drinking too much. Marijuana is an all-natural plant, and if you smoke too much, you may simply find yourself laughing, eating, or taking a nap. Each year, thousands of people die from alcohol. According to the United States Center for Disease Control (CDC), each year more than 37,000 deaths are directly attributed to alcohol consumption. This number doesn't even include accidental deaths. On the other hand, the CDC doesn't report on deaths that are caused by users who enjoy marijuana because there are none.